Hide deals from seller "American & Foreign Car Clinic"
Limit 1 per person. Valid on a standard oil change and 12-point inspection. Includes up to 5 quarts of standard Castrol motor oil; synthetic oil not included. New customers only. Promotional value expires 60 days after purchase. 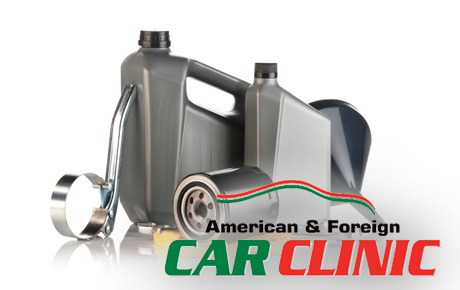 Maintain your vehicle with 50% off an oil change at American & Foreign Car Clinic in Arlington Heights ($40 value). One of the experienced mechanics at this auto shop will give your car a standard oil change as well as a 12-point inspection to keep your car ready for the road. American & Foreign Car Clinic specializes in tire sales and repair, but this full-service auto repair center offers all the services you need to keep your car running perfectly. From muffler, brake and engine repair to 24-hour towing and auto parts, this car clinic has you covered. The ASE-certified mechanics at this shop have been providing top-quality repairs and maintenance since 1973. Keep your engine clean with this deal. Auto service and repair center in Arlington Heights servicing foreign and domestic models.